Only when we take time to rejuvenate, look within, and rest ourselves do we reach our full potential . Peace is always here. Simply put your attention on peace. 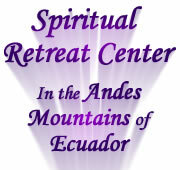 Spiritual Community & Retreat Center! meditation, yoga, workshops, vegetarian meals, spiritual friends and companions, hot tub, sauna, fresh mountain air, hiking, and magical starry nights! Why The Name Gaia Sagrada? Gaia Sagrada is the perfect name for our spiritual community because we strive to be one with Mother Nature and live harmoniously on the Earth, which is a sacred being. 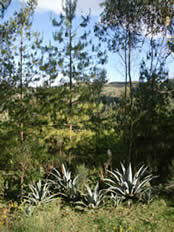 It is also the perfect name because this is a sanctuary of support and nurturing amidst natural beauty. Cuenca, Ecuador was picked because of its low expenses, safety, ease of entry for visitors (no shots or visas required, only your passport), and also for its gorgeous, magical, and natural settings. Ecuadorian people are very friendly and helpful, "muy tranquilo!" Gaia Sagrada is nestled in a small community called Llazhatan (Ya-zat-yan) in the Andes Mountains, very close to Jadan (Ha-dan). If you have ever wanted to live at an ashram or retreat center, without a lot of dogma or wearing specific outfits, this is your place! 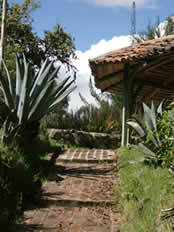 Spirituality at Gaia Sagrada is varied. We horor all paths. While spiritual methods and focus are the core of our community here, you are not required to adhere to any specific religious or spiritual beliefs. You are able to be yourself. Enjoy a day or a month in workshops and classes which explore processes of consciousness. These workshops are for personal retreat, self inquiry and enrichment. Eat all natural vegetarian meals made from fresh fruits and vegetables, hike in beautiful scenery, swim, take a sauna, sing by the campfire, or sit in the hot tub under the stars. Relax in beautiful nature meditation spots everywhere on the land, or take a trip into the city of Cuenca to see the historic sites. If you are coming for spiritual community living, you will find a beautiful model in action. 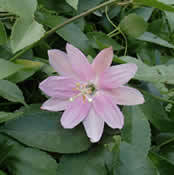 Eco-practices are widely used and you can learn something for your own building endeavors in the future. Spiritual focus is at the core of the community, so you will have an opportunity to dive deep into your own consciousness with others of like mind. People here are living in a stress free environment, separated from the world, in a way that is rare and hard to find. Whatever you find nurturing and adventurous for your consciousness and spirit, you will find it here! 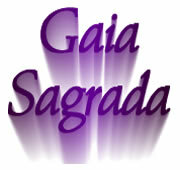 Welcome to Gaia Sagrada ! Take time to write a poem, paint a picture, or play a song. Whatever creative outlet you like to use, make the time to be creative. When you give the creative self a chance to shine, this is how all the other parts of you shine as well!